"These fires were lit by the hand of man." In 1977 WS Noble published "Ordeal by Fire. The week a State Burned Up." His son, Frank Noble, has kindly given the FCRPA permission to use his father's book on this site, and a copy of the book is available here. 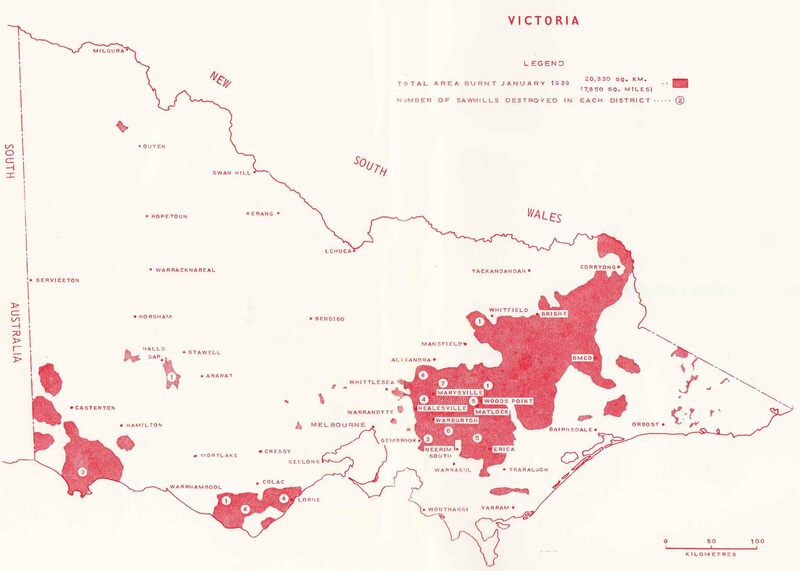 Photos from the book are also displayed in the gallery below, this map showing the extent of the fires is also taken from the book. Below is a screen shot from the Hand of Man (5min11sec in), when the narrative is about Mt Horsfall. As poor as the quality is, it gives an indication of the impact of the firestorm on the mature Mountain Ash forest growing on Mount Horsfall. Click on the photo to see what it looked like before the fire. The Report of the Royal Commission is available here.